1st – by copying other traders that know what they are doing. 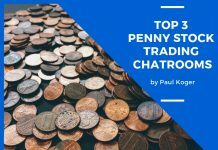 So you’ve somehow stumbled onto Etoro and you would like to know what’s the best way to make money with the social trading platform? 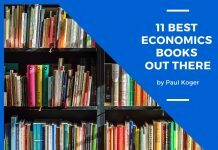 After having used the site for over 3 years, I will share my opinion on what’s the best way to milk it for your own financial gain. First off, there are 3 main ways you could make money with the site. 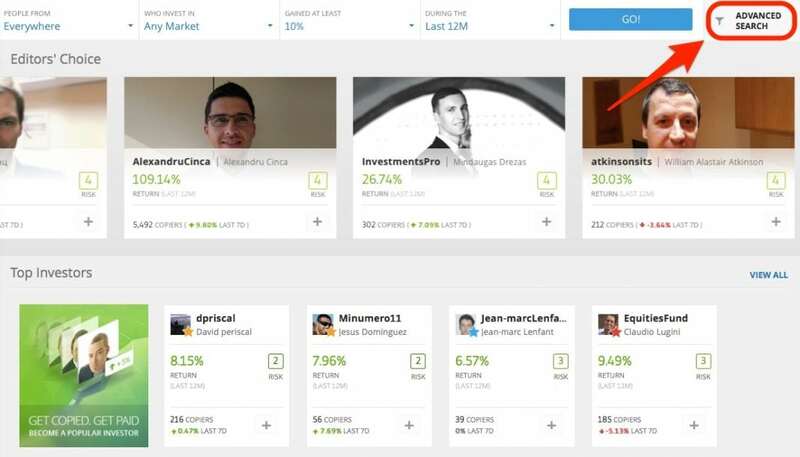 The main contributor to the success of eToro is their ability to copy other traders. It’s brilliant – you search through their database of ca 200 000 traders that allow to copy their trades. You find the people whose trading style makes sense to you and that have a risk profile that you can live with. Out of the 200K traders, there are some true among them. People that have been making around 100% return per year with rather low risk level. But more on that at the end of this post (jump to the end if you want to). The copy traders (you and me) – we are able to just copy people that know what they’re doing without having to do anything ourselves. The traders themselves – they make money for having people that copy them. This can amount to a nice additional income once you have a decent amount of followers. You can jump to the end to check the full guide on how to copy successful traders. You will get a 100% spread rebate. What this means is that your trading costs will be a lot lower. eToro is making their income from the people that follow you, so they incentivise good traders to come and trade with them. Pro traders are motivated to do so as it is hard to find smaller spreads elsewhere. You will earn a management fee. The exact amount depends on the amount of money that is set to copy your trades. However this can amount to a substantial sum each month. You need at least 500K$ to be put to copy your trades in order to reach the 2% of AUM. This is where the serious money will start to roll in. For example: 2% on 500K$ of assets under management is 10K$ per month. That’s a lot of money! Another example..one guy that I personally copy is Aleksander Pleskatsev from Russia. He has made ~100% return for the past 12 months. And because of that, there are over 8000 people that have decided to copy him. Those 8K copiers amount to over 5M$ of assets under management, which is a total of 100,000$ of monthly asset management income for Alex. That is some insane amount of money if you ask me. However it is not easy to achieve those levels. For that you would really need to know what you’re doing and to be profitable. Otherwise no one is going to copy you. NB! 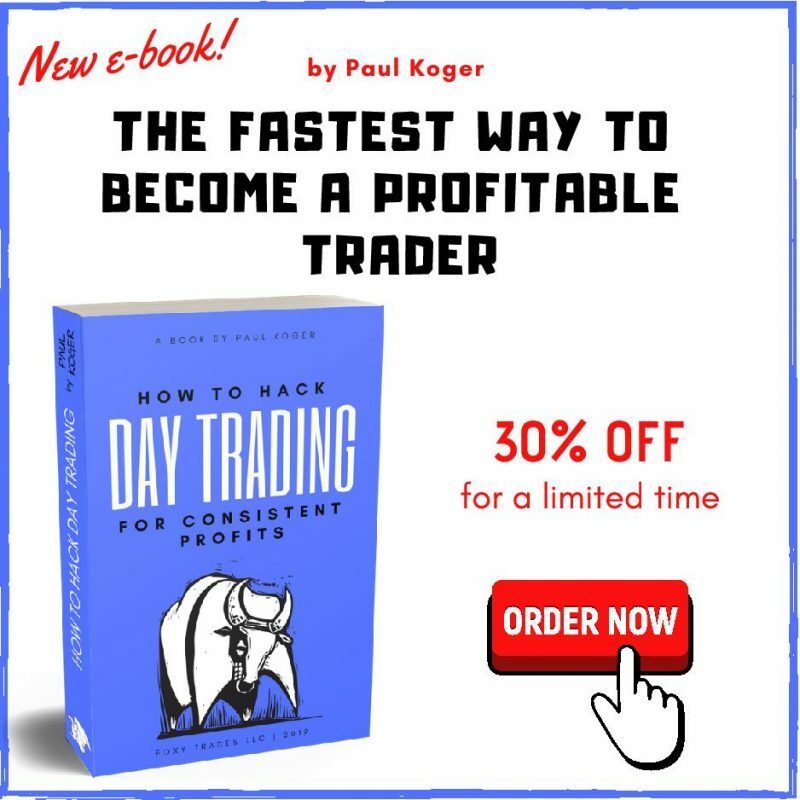 There’s actually a way to earn income as a popular trader without knowing how to trade. The little trick is to put together a portfolio of traders that you copy. As your own portfolio starts earning you money, it will have less risk than any single trader while still making a decent amount of income. 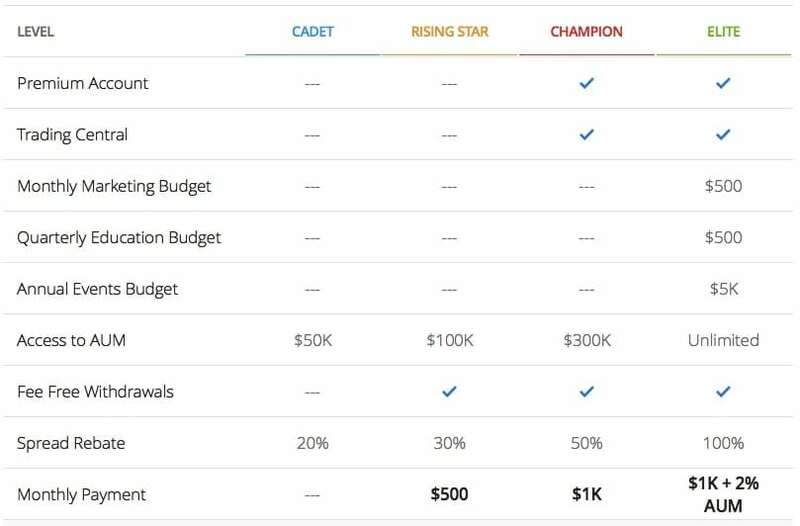 You might become an attractive “portfolio manager” to copy and you’ll start earning money from just picking the right people to copy by yourself. 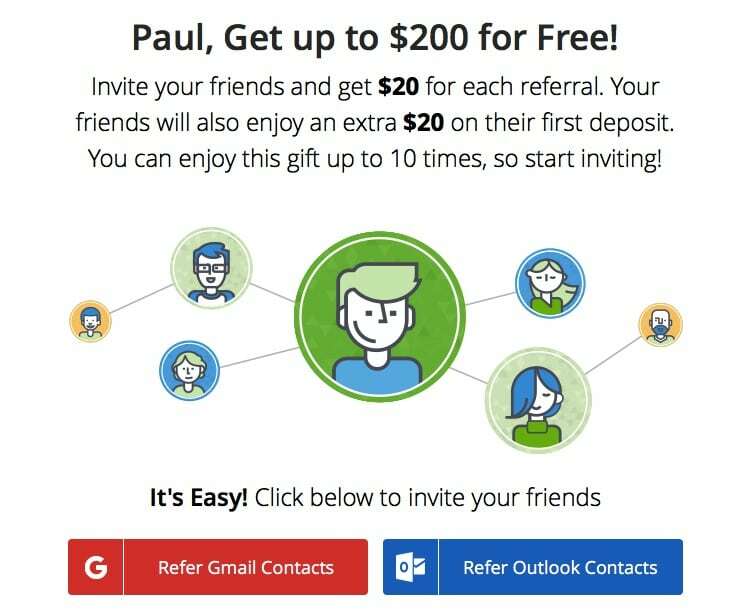 You can make some money via inviting your friends over to eToro. This may not seem like much, but you will both earn an additional 20$ to trade or copy other traders with. This can be used on up to 10 people. So if you have a lot of friends or have other ideas on how to get people to eToro, you may want to check out their partners’ program. 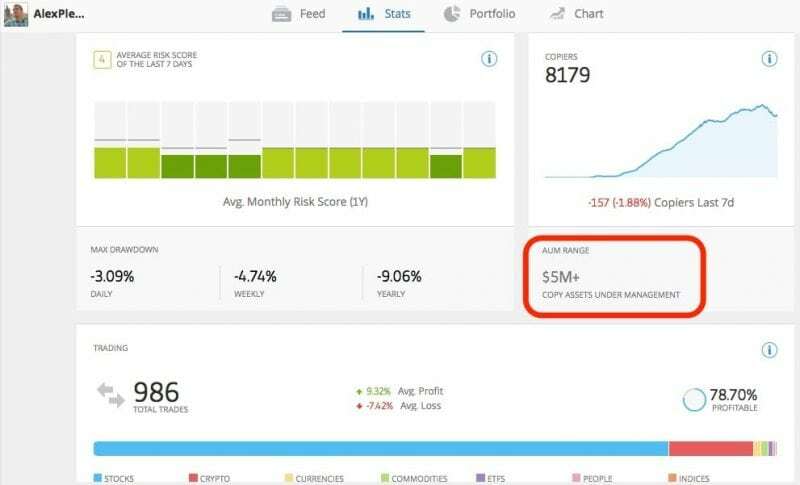 As a partner you get a 25% revenue share of the trading costs that your referrals will make on eToro. 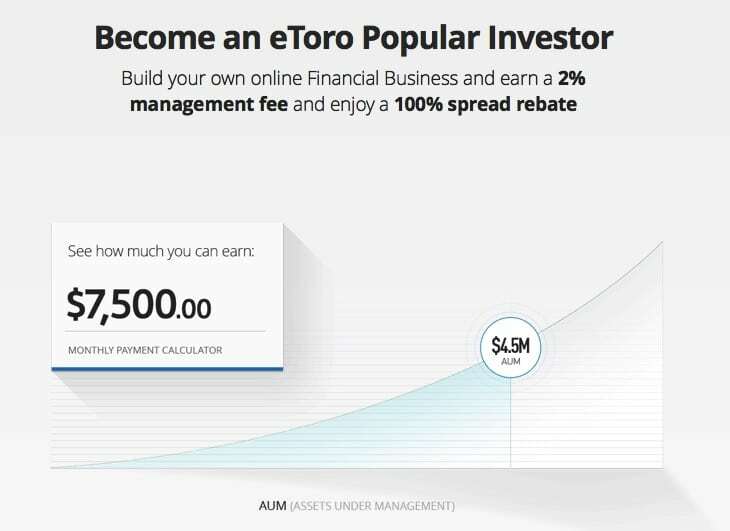 This can be a much more lucrative option for people that are serious about promoting eToro. One great way to do this is to just start a public case study of your own copy trading journey. About how you chose who to copy and how has it been for you. I recon that people are highly interested in how someone is actually doing with copying other people. If they see your results, they are much more likely to do the same. 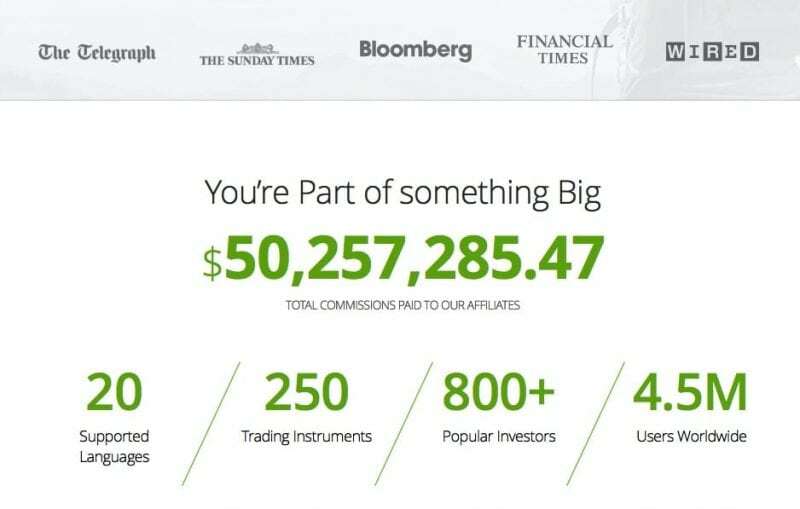 eToro publicly claim to having paid out over 50M$ to their affiliates, which seems like a huge amount of money. However, it is likely that only a hand full of people have managed to earn most of it. If you’re interested, head over to their eToro Partners page to find out more. 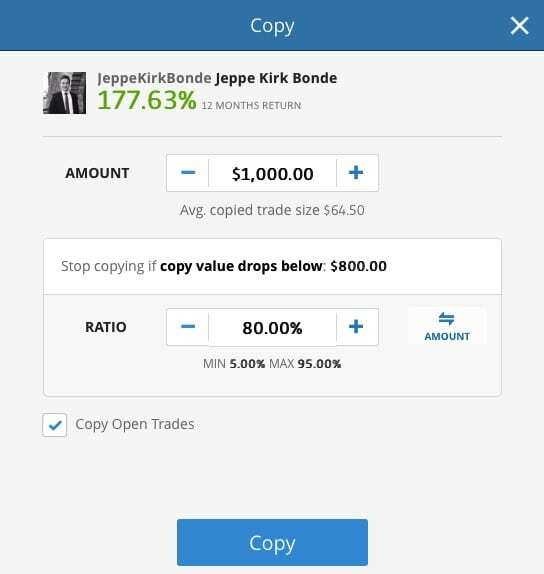 Now after listing the 3 main ways to make money with eToro, the easiest of them all is still copying other people. I personally use it as an alternative investment vehicle that stands in the middle of investing and day trading. Once you pick out the traders that you will copy, it’s a rather passive form of trading. It is advisable to still monitor the results of the people that you follow from time to time to see if they have strained from their strategies. However as they are highly motivated to keep their followers, it is not so likely that they would do anything foolish. One key element to being successful with copying others is to diversify your funds among at least 10 people. 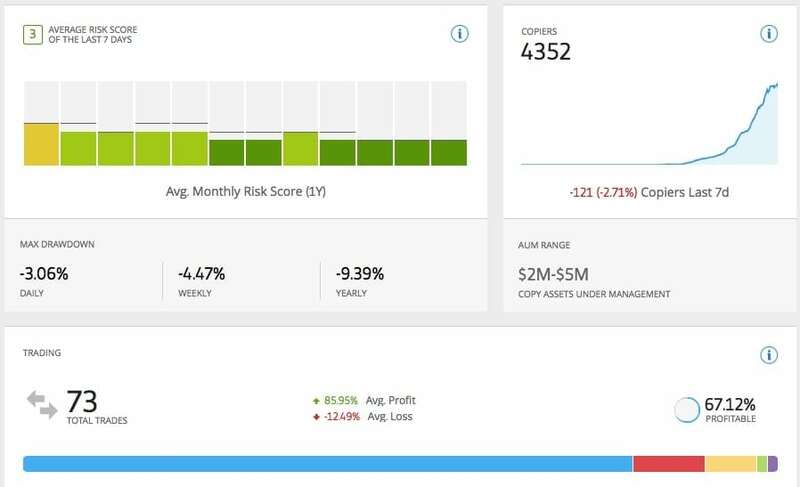 Risk score – use from 1 to 5 instead of 1 to 6. 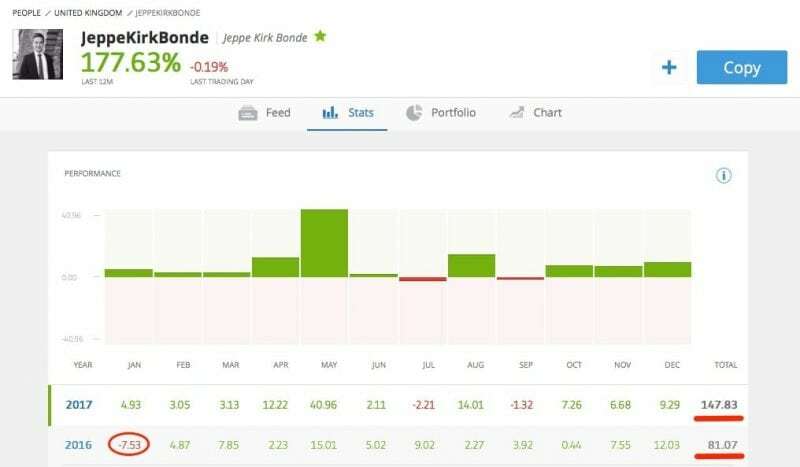 The scoring is based on eToro’s internal system and it ranges from 0 to 10 with 10 being the riskiest. This largely depends on your risk tolerance, but I personally like to use low risk traders for my portfolio. Amount of trades – use a minimum of 25, instead of 5. If it’s only 5, chances are they have been lucky with a few trades and their success might not last. Copiers – I like to set a minimum of 50 copiers. 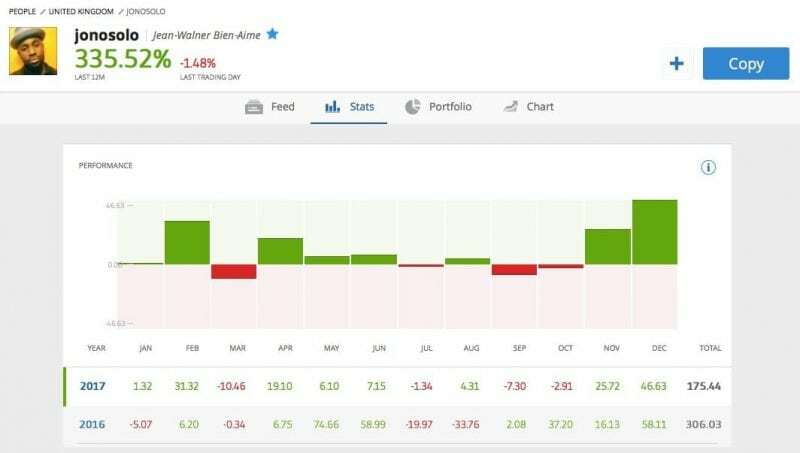 This is because I like to see that the people have started to gain some attention through their good results and that other people have considered them as good enough traders to trust their money with. I sort them based on return and start to check them through one by one. The main thing that I’m looking for here is consistency. It appears that Jeppe has been trading on eToro for a while. You can’t see from the picture here, but if you expand on the past results, they date back to 2013. This means that he is no overnight success story and has been around for a while, which is what I like to see. Another important factor is the monthly results. I like to see that the returns are fairly consistent and equal without major setbacks. Jeppe does have an outlier, which was the 40% return in May. However, this is not a bad thing. Being a trader myself, I know that there are some days where you may find a massive opportunity, which is not to be found on most days of the year. Overall his results are fairly consistent ranging from 2 to 15% per mont. He was in the red only 3 months out of 24, which is great. The 7.53% loss in January of 2016 is bad, however given the overall yearly profitability – 81% return for a 7.53% maximum monthly drawdown is still a very good result. From the rest of his stats I can see that he has a fairly low maximum drawdown given the impressive results he has been producing. 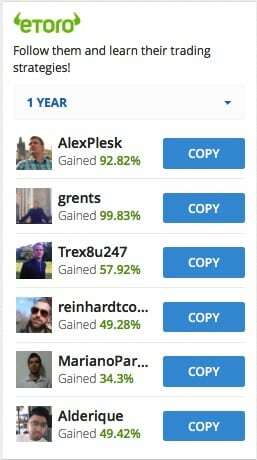 Jeppe has been profitable 67% of the time and his winners are much bigger than his losing trades. He has a lot of money allocated to copy him, which means that he is motivated to stay on a good track. Overall I would allocate 5-10% of my funds with him. However, I don’t copy someone before going through the whole list first. I suggest you do the same and make a note of all the people that you liked in order to end up with your top 10-20 traders. Once you have a list of traders whose risk and return ratio seems to satisfy your preferences, it is time to allocate your funds with them. In order to do that, simply click on the blue “COPY” button on the upright position of their profile. Now choose the amount you wish to allocate per each trader. In my case, I have a 20K$ account, I use 5% per trader. The second thing that I advise is to use stop copying function. What this does is it stops copying the trader once they lose a certain amount of money. In my case, I usually set it at 80%, which means that if they lose 20%, I will automatically stop copying them. This is a good tool to use for extra safety. The final thing I use is to copy their open trades. I figure that if they still have their trades open, there must still be potential in them so why not hop onto those trades as well. 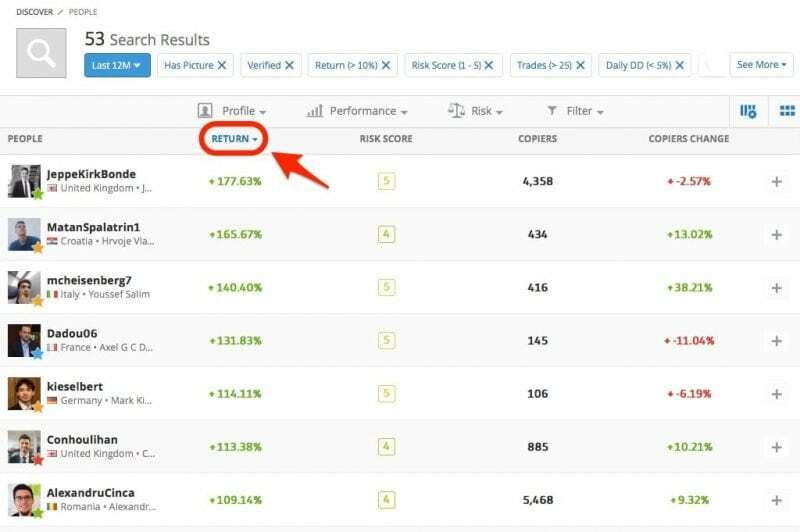 Now as you’ve seen the 3 main ways on how to make money on eToro, I think it’s time for you to test it out for yourself. Head over to eToro and open up a demo or a live account to start making money with it. In case you have any questions/comments or personal experience to share, please drop a comment below and I’ll be sure to get back to you. NB! As all trading is risky, I strongly advise you to only risk the amount of money that you can afford to lose! The information presented here is for informational purposes only. Next articleTrading BitCoin and Crypto Currencies – Should You? Appreciate the depth of the information that provided, Paul! 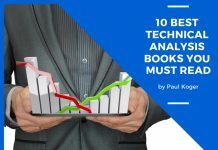 1Q: How often do you monitor or replace the traders that you are copying? ..I mean they might start performing worse at some point.. I agree on having to focus on the consistency part of the results. However the 7.5% downfall would scare me off in your example. On the other end, I’m not aiming for 177% per year, could not bear that amount of risk in my portfolio. Anything north of 50% is decent imo.. I understand where you’re coming from. However I do use more than 10 traders in my portfolio, hence monthly downfalls of 10% are acceptable. This is a barrier that everyone would have to set by themselves though. is it possible to earn atleast 10% per week on etoro? Thanks for the detailed tutorial. One question I have is how exactly your account is copying others’ trades? Is that by proportion? For example, if you allocate $1k to copy Trader A, who has $1,000k in his account. Today he decides to long multiple trades costing $500K. Does that mean your account will be longing $500? What if the stock price is high and the $500 can’t round up to the same proportion, or even if the price is so high that $500 is not enough to buy 1 share? Also how about commissions? Another question is would the order type is copied as well, such as market or limit? Would that depend on the broker we choose? Last question is would there be any lag in terms of spread? If Trader A is trading in a very tide spread then I assume any lag would kill the profit. What do you recommend for trading in California or Texas since ETORO is not available ?